Fun Teen Slumber Party Ideas - Get The Party Supplies, Party Favors, Teenage Slumber Party Games You Need To Host A Teen Sleep Over Party. Girls enjoy sleepover party ideas. There are so many fun ideas you can use when you plan your daughters slumber party. Crafts, spa experiences like manicures and pedicures, fixing up hair and playing with make up...it's all part of being a girl. Teens like slumber parties as much as young girls do...the thing with a teenage slumber party is the games...you need more fun party games when you have teens sleep over. 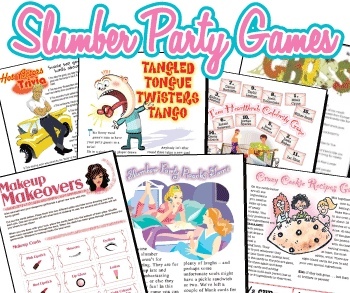 And I have found the solution to that...check out these printable Teenage Slumber Party Games. To find out more about these printable teenage slumber party games visit The Coolest Fun Games Site. It's an assortment of favors the girls will like. Here is a fun party activity that turns into a party keepsake...it's the Sleepover Autograph Pillowcase. It's a cute pillow case each of the girls can sign. The hostess then gets to keep this as a keepsake of her slumber party. Need A Sleep Over Party Cake? Here is a cute Slumber Party Cake you can make with a rectangular cake and some twinkies. Rolled fondant makes the blanket and hair for these sleepover girls...check out this fun sleepover party cake.